A project with my teacher Laurent Jégou was to design a recent map with an old map style. Some students chose to make the opposite, making an old map looks like a recent one (for example Rome in 300 A.D with an Open Street Map style). 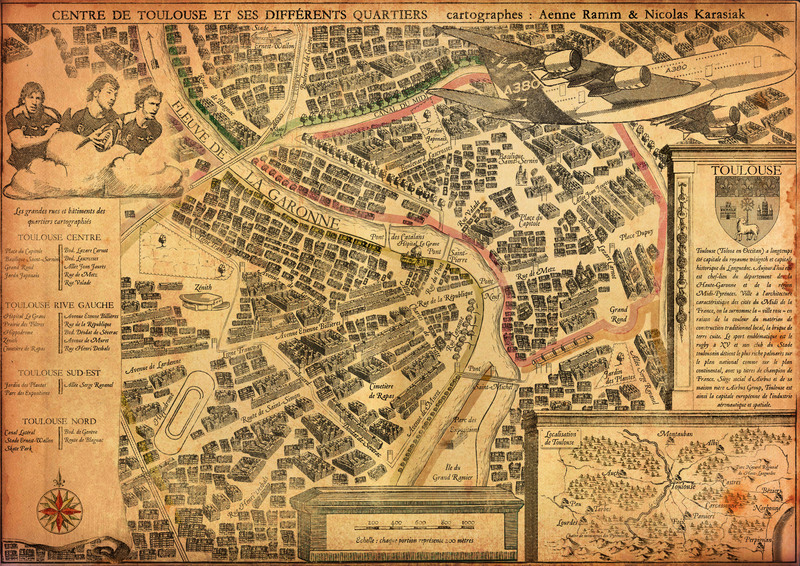 I took the first project and I worked to make an actual map of Toulouse with an old style. I got most of my inspiration with the Rome map available on geotests (16mo). I started to download (screenshot) a basemap from Open Street Maps, I place it on a base layer on illustrator to draw main curves (bridges, river…). After drawing the border of the river, I’ve made a specific brush to look like the old river. 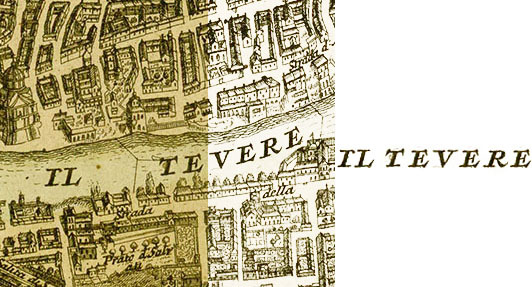 To get the perfect fonts, I cropped some text like “Il Tevere”, I manage to have a good constrat in photoshop (black text and white background) and send it to WhatTheFont to find the perfect one. This part was certainly the most boring one and the biggest one. To be sincere, it’s easy to do but very time consuming, so I give it to my friend Aenne Ramm. 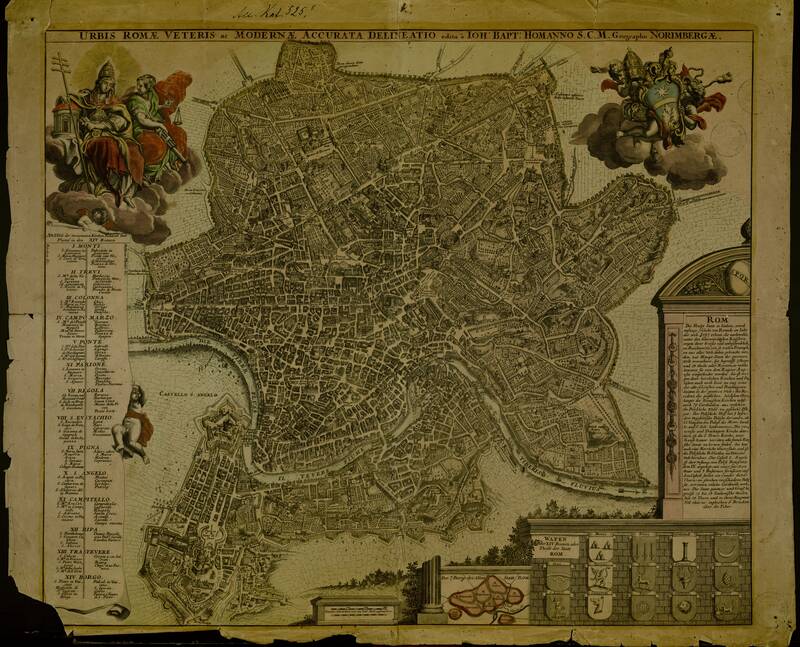 What I have done is to crop lot of buildings I got from Rome map and from the Plan Turgot de Paris and send them to Aenne so she can place them. Then I drawn some trees and some specific shapes (fields for example). To easier the process, I took photoshop to crop buildings, change the contrast to have a clear white background, vectorize it automatically with lllustrator, made some little changes, and send the building packages to Aenne. Then Aenne vectorize the Zénith, the Stadium, the Tram, and the main border of the A380 plane. I use Halftone Automator in Photoshop to get the shadows. 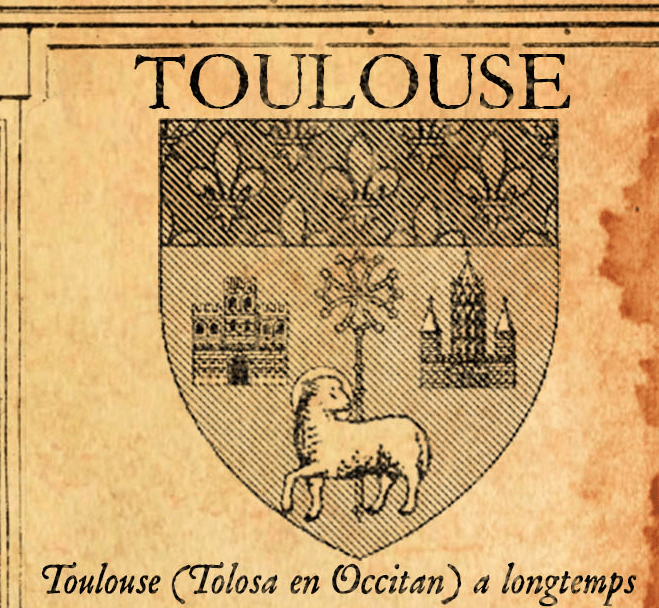 For example I only use this script to make to rugby players looks like an old drawing (with only diagonal lines), and to make the Toulouse blazon. All my work was done with a black background, so the result looked weird, too clean to be old. I took an old texture map found on Google, place it above all layers, and made its overlay in product. Then I use some scratch brushes to age the map and make it more real. The final result is available here : (4961×3509 pixels, 300dpi, 5,8mo, printable on an A3 format). Next: Next post: How to get rid of “unknown enum QgsMapLayerProxyModel::PluginLayer” in Qgis ?